Jun 24 Koi Feeding: Dinner’s Ready! Feeding your koi is a beloved part of being an owner. It’s a chance for these sociable fish to come to the surface and connect with their owner! And while it may be fun to watch your fish friends flop over one another to get a glimpse of you, koi feeding needs to be regulated and monitored to ensure the health and wellbeing of your koi. Koi will get bolder and braver the more familiar they are with you. There are a few different kinds of food you can be feeding your koi: fresh foods, freeze-dried foods, and prepared foods. Prepared pellets are the most convenient because they are created to meet all of the nutritional needs of koi fish, but fresh and freeze-dried foods can be added as a supplement. When it comes to prepared foods, they vary in shape and size. They also come in floating or sinking varieties. Floating pellets are recommended because they let you see if you’re overfeeding your fish. You also get to watch your koi come to the surface to feed – one of the joys of koi ownership! As for fresh and freeze-dried foods, they vary from blood worms, brine shrimp, clams, and chopped vegetables. All are acceptable for supplemental feeding. 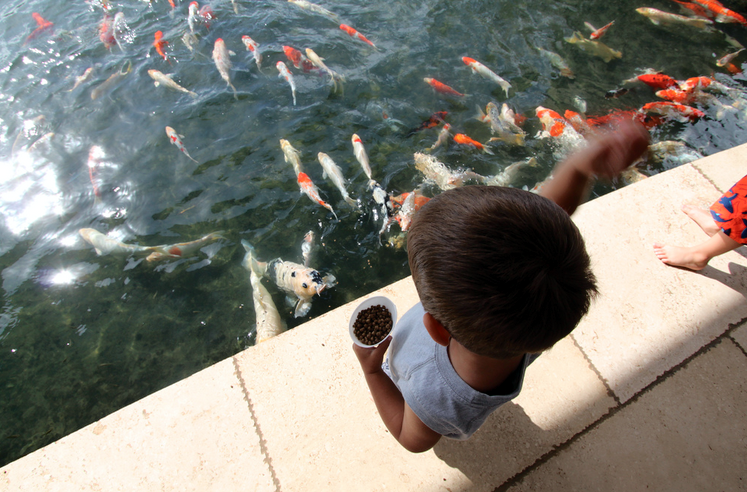 Prepared food pellets are an easy way to feed your koi and meet their nutritional needs. When feeding your koi, disperse small amounts of food at a time. Watch as your koi come up to eat the food. Only feed your koi as much as they can eat in five minute sessions. Feed your koi three times a day: early morning, early afternoon, and late afternoon. Stick to this schedule to avoid overfeeding. Overfeeding not only harms the health of your koi, but also pollutes their water. 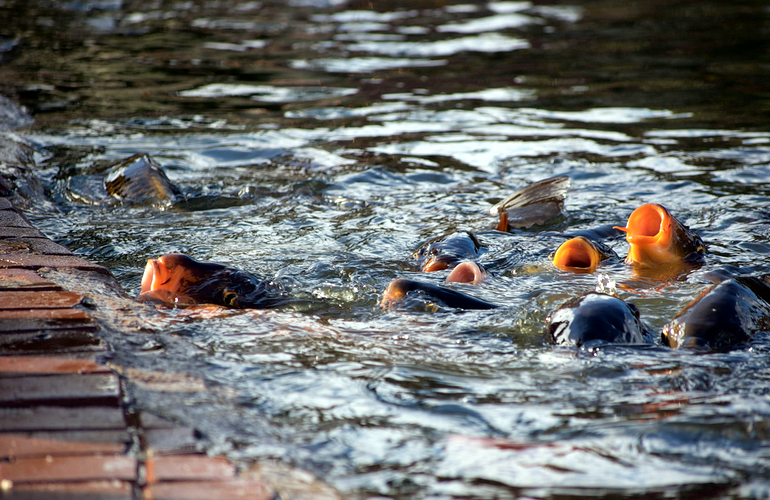 Koi will overeat when overfed, so make sure you stick to the 5-minute feeding schedule. If any extra food remains after twenty minutes, clean it out of the tank. Your koi fish will gradually become more and more comfortable with you as you feed them everyday. Make sure you stick around when feeding them so they can see you. This will build the trust between fish and owner. Soon, they will be practically leaping out of the water to feed from your hand! Let your koi fish see you when they eat instead of walking away. They will become more comfortable with you. Did you know that your koi have different nutritional needs throughout the year? This is because they are a cold-blooded animal: they’re affected by their water temperatures. A koi’s metabolic rate is much faster in warmer temperatures than in colder ones. In fact, when water temperatures drop below 50˚ F (10˚ C), koi do not need to be fed at all if they are in healthy condition; they live off their own body fat. The temperature that is recommended for best growth is between 73˚ F and 86˚ F.
While there are some specific nutritional needs that should be met when feeding koi, these vary throughout the year. Start feeding your koi again once the water temperatures reach 60˚ F (15.5˚ C). Ease them back into an eating regimen by serving small portions. When koi begin to eat again in the spring, they need foods that are easily digestible, such as wheat germ, rice, or vegetable protein. As temperatures warm up, koi need food that will support their growth and development. Feed them more protein and lipids during the summer. Come fall, return their feeding to the spring’s regime: more easily digestible foods. Remember to change feedings throughout the seasons. Feeding your koi is a special but important part of ownership. Do you have photos of your koi feeding? Send them to us via the contact form!